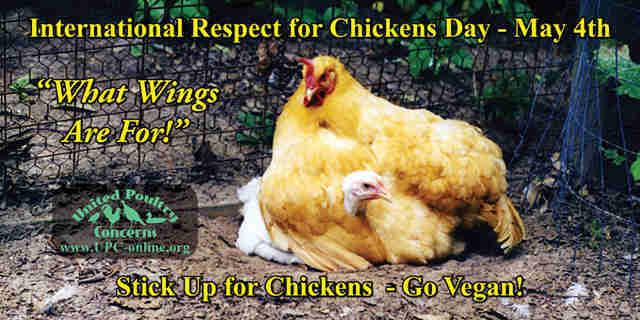 On May 4, animal advocates celebrate International Respect for Chickens Day. Launched by United Poultry Concerns in 2005, International Respect for Chickens Day celebrates chickens throughout the world and protests their suffering and abuse in cockfighting, agribusiness, experimental research, and other cruelties. 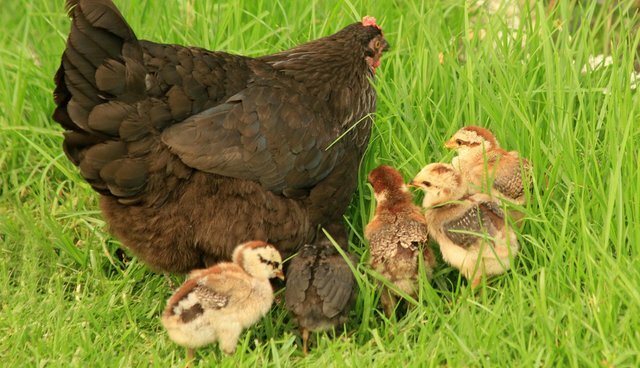 "We urge everyone to do a compassionate action for chickens, on or around May 4," says Karen Davis, president of United Poultry Concerns which promotes the compassionate and respectful treatment of chickens and other domestic fowl. "A library display, a vegan open house, an informative blog post, or simply talking to family and friends about the plight - and delight - of chickens are great ways to stick up for chickens," Davis says. In honor of International Respect for Chickens Day, United Poultry Concerns will launch a five-minute video May 4 exposing the hoax of "humane" eggs and chicken products. The video features interviews with shoppers at a food store in California, showing how little people know about the food they eat and how susceptible they are to false advertising. "Happy chickens are cheerful birds," says Davis, who maintains a chicken sanctuary in Virginia. "Chickens love the earth and sun, yet millions are sitting in filthy dark buildings on crippled legs breathing polluted air, as described in my book 'Prisoned Chickens, Poisoned Eggs.' After they are dead, salmonella-infected chickens are soaked in toxic chemicals."